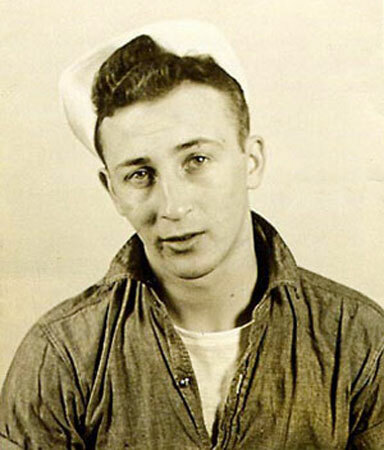 "Uncle Rudy, a first generation American, enlisted in the US Navy on 19 May 1942, short of becoming a 1943 graduate of St. John’s High School in Bellaire, OH, and was accepted on 3 June 1942, in Martins Ferry, OH. His father signed the enlistment form, since he was under the age of twenty-one. Uncle Rudy reported to the US Navy Recruiting Station in Cleveland, OH, on 6 June 1942. "Rudy volunteered for submarine duty and reported to the U.S.N.T.S, Great Lakes, IL, from 8 June through 30 September 1942 as an Apprentice Seaman. He furthered his training at the Submarine Base in New London, CT, from 1 October 1942 through 11 February 1943 as a Seaman, Second Class. He then reported for training on the submarine Tullibee, in NYD, from 15 February to 5 April 1943. He then went to COMSUBFORPAC, Mare Island from 5 April to 5 June 1943 with the rating of Electrician’s Mate, Third Class. From 19 June to 28 June 1943 he served at NOB, Dutch Harbor, Alaska. He was assigned to CSD-52 from 28 June to 12 July 1943. On 12 July 1943, he was assigned to the USS S-28 where he served until his death. Interpretation on information on the service record was gratefully provided by Tim Barker, CDR, USN (Ret), C.O. USS Wahoo (SS-565). "We wonder, “What if Uncle Rudy had survived the War?” Would he have become the man that he was born to become? Would he have married? How many children and grandchildren would he have had? What other contributions would he have made to mankind? Only God knows! For your sacrifice, we pray for your eternal happiness in Heaven!" Information and remarks courtesy of Phillip Emmerth, husband of Rudy's niece.